My Rating: Very Good - for a freebie, but Microsoft .NET Framework is a big obstacle for me. 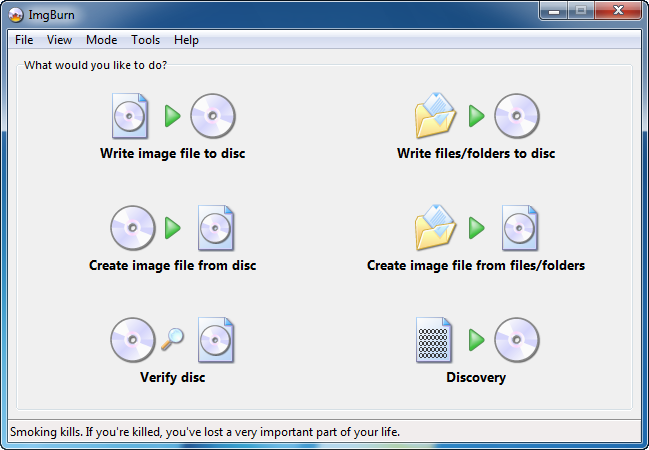 CDBurnerXP is an easy to use CD/DVD burning software, that can write CD-R and CD-RW discs. The program can also write disks directly from an ISO image file, and save image as an ISO image file (*.iso). You can create data and audio CDs, and it supports Burn-Proof technology, multi-session disks, import of ISO images and more. In addition to CD burning, you can also rip audio CDs, normalize WAV files, encode MP3 files, erase disks, . CDBurnerXP does not require ASPI when used under for NT/2000/XP. My Rating: Good - BurnAware Free does exactly what is says, nothing more. A good and most importantly free alternative to things like Nero, at least if your needs are just simple burning. A ''Pro'' shareware version is available with more features. This program automatically installs the Ask.com toolbar unless you opt-out. BurnAware allows you to easily perform the most common disc burning tasks: write to all CD/DVD media types, including Blue-Ray; write Audio CDs and DVD-Video files; create and burn disc images; write multi-session discs and much more. BurnAware Free is one of the most popular free CD, DVD, Blu-ray Disc burning software available for Windows. Using this program you can easily create and burn Audio and MP3 CD, Data and DVD-Video disc, ISO and Cue Image, erase or format rewritable disc, copy your CD or DVD to ISO image. My Rating: Very Good - Ashampoo Burning Studio is everything you need it to be, and you just can't beat German engineering. Ashampoo Burning Studio is the perfect Nero replacement, small size, extreme fast speed, superb features and clear user interface, whatever you are a veteran or a beginner, you will feel it's developed for you. The 2010 version added more features but the overall size increased up to 80MB. At this point if you really want to replace NERO give it a try if not switch to ImgBurn for smaller size and powerful features. Ashampoo Burning Studio users are unusually loyal, with good reason – this program’s speed, simplicity and efficiency are simply unbeatable. Over the years the Ashampoo programmers have turned the program into a full suite that can handle all your data, audio and video burning and authoring tasks, without sacrificing its famous ease of use. In version 10 they have once again added a wealth of new features and modules, but the program is still amazingly intuitive to use – everything is explained as you do it. The main focus of this premium version is even better authoring capabilities for building video and audio discs using the latest formats. HD and Full HD video (720p and 1080p) are now fully supported for Blu-ray discs, and all the encoding is handled by Ashampoo Burning Studio 10. All the authoring tools have been overhauled and the video encoding quality is even better than before. You now use the same new integrated editor for building DVD and Blu-ray video disks with menus. The program also starts more quickly and is generally snappier to use. In addition to this there is a new Autoplay Editor module with which you can build auto-starting data discs with attractive interactive menus – for example for collections of programs. 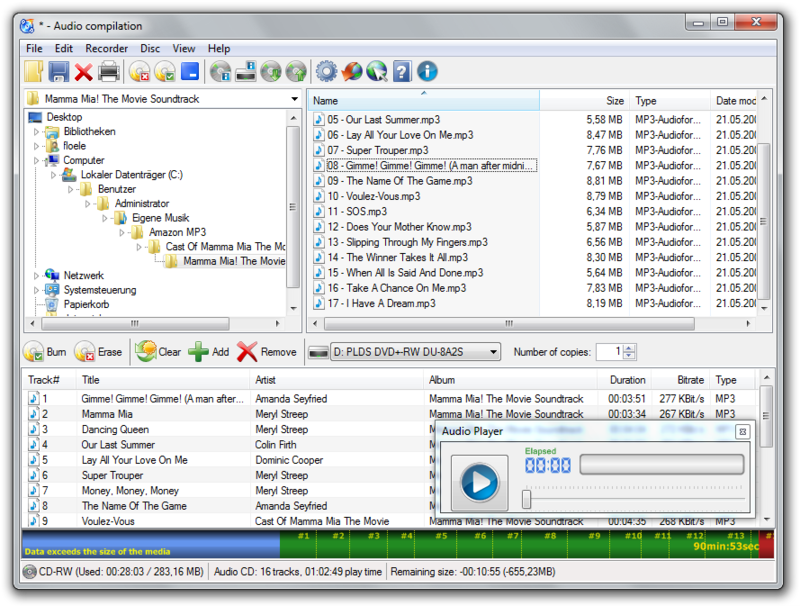 And there is now also a new Audio Player with which you can play audio files and audio CDs without leaving the program. 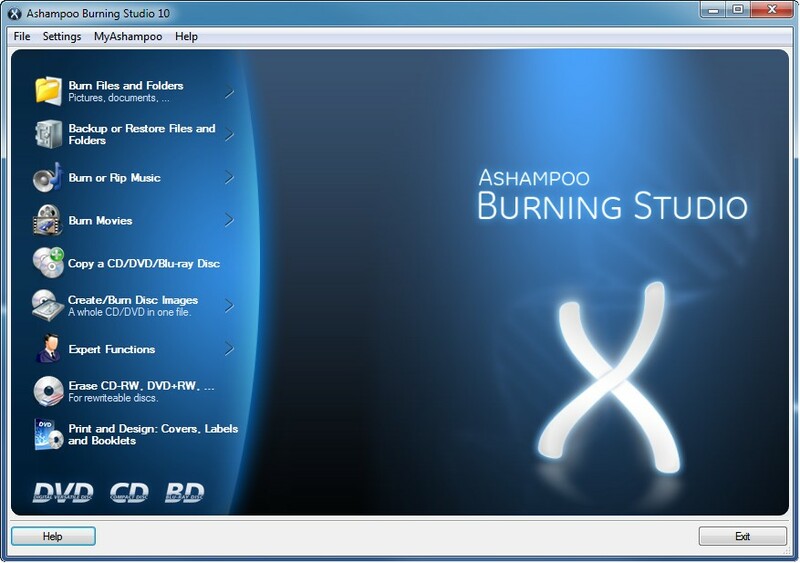 The new Ashampoo Burning Studio is the all-round tool for all CD, DVD and Blu-ray disc burning tasks. The main focus of this faster, more powerful premium version is even better authoring capabilities for building video and audio discs using the latest formats. HD and Full HD video are now fully supported for Blu-ray discs, and all the encoding is handled by Ashampoo Burning Studio. My Rating: Poor - Nero BurnLite doesn't says anything new to me. Nero AG try to rescue the boat that sinks building a ''Lite'' version of his over bloated Nero Multimedia Suite 10 Platinum HD but it fails horribly by stripping down all the useful features for a normal use and forcing the users to install the ASK toolbar. Good only if you want to give away your old computer to Grandma. 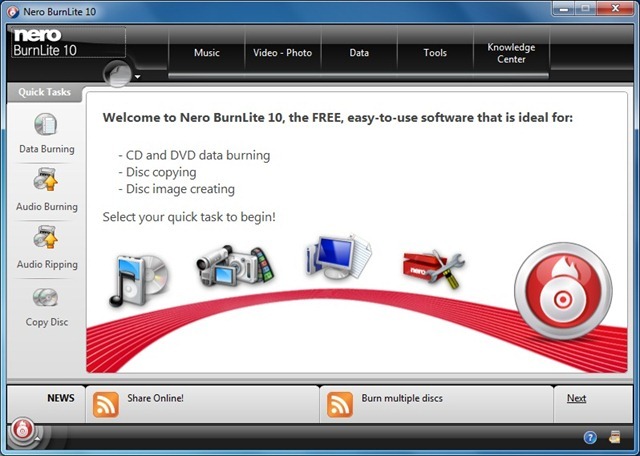 This version of Nero BurnLite 10 contains simply data burning and disc copying features for CDs and DVDs. Additional features and functionality are available with an upgrade to Nero Burning ROM or Nero Multimedia Suite 10. 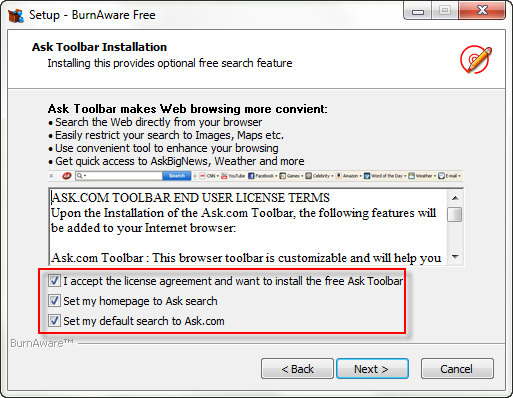 Nero BurnLite 10 installs the Ask toolbar without the users consent, here is how to install Nero 10 Free version without Ask Toolbar. My Rating: Good - The price is atractive has a lot of features. Prassi Ones has a clean interface so is very easy to use. A good Nero perfect replacement for XP based systems. Not sure about the compatibility with VISTA / Windows 7, Prassi Ones hasn't been updated since 2006. ONES has been designed to meet the needs of both beginners and experienced users alike, thanks to its intuitive and user-friendly interface. ONES is different from other CD/DVD burning software as it uses an innovative new recording technology which means that it can function with any existing or future CD/DVD recorder. Updates are no longer necessary. ONES stands out from the crowd in implementing innovative recording technology with a unique Fuzzy Logic approach. It’s a totally driver-less application that will not require new versions to manage most of the new CD and DVD recording drives that are coming to the market. Burn easily DVD Video, DVD ROM, Audio CD, CD Rom, CD Ex. Dynamic interface for both beginners and power users. User is shielded to make setting mistakes. Totally Driverless Application; no frequent download updates are needed. Create easily Audio compilations from MP3, WMA or WAV. Full support of CD-R 100 Min. DVD Native application open to all new DVD standards. My Rating: Very Good - The price is not so atractive but Padus DiscJuggler has a lot of features. A little outdated since the last version made available was on 2006. DiscJuggler Standard Edition, DiscJuggler Professional Edition and DiscJuggler.NET are software applications designed to do a variety of tasks with optical storage discs. Each of these products support the Windows 95/98/Me/NT/2000/XP/2003 operating systems, but not all features may function on older operating systems. The program’s feature set is designed to provide any CD or DVD writing drive owner with a comprehensive set of disc creation, duplication, and extraction functions in a straightforward user interface. DiscJuggler Professional Edition Net contains all of the features listed above, including the following features. My Rating: Very Good - The price is awesome (free), Infra Recorder is made by the same author of TUGzip and is based on CDRtools technology. Save audio and data tracks to files (.wav and .iso). My Rating: Very Good - I must confess, personally i never liked the shareware/freeware restrictions in a program, for me a piece of software is 100% free or not but DeepBurner has enough features even in the free version so i think is pretty good for a freebie. Also you'll be surprised by the DeepBurner spartan interface but if you want a Free alternative to NERO than you should say thanks to AstonSoft for this great little program. A portable version is available too that works straight from removable media, whether it's a USB flash drive, compact flash card, or even a good old floppy. *Available in DeepBurner Pro only. My Rating: Fair - because the interface reminds me of Sateira :unsure: otherwise is ok. AV Burning Studio is a good burning suite but never will replace NERO; if you have some bucks to spend ($29.95) take a look at Ashampoo, Prassi Ones, DeepBurner or try a freebie. My Rating: Good - not bad, not bad at all for a newcomer. Oront Burning Kit has a clean interface and will perfectly fit your daily burning needs. Not recommended for a ''pro'' user. Interface very similar to InfraRecorder ?! If you really want to spend 30.00 USD just go with BurnAware Home. Burn files and folders to Data CD, DVD, Blu-Ray, HD DVD. Backup your photos, music, movies and important documents. Create and burn MP3 CD, DVD, Blu-Ray, HD DVD. Create MP3 disc that can be played on a home player with MP3 support. Create and burn Audio CD from MP3, WMA and WAV file formats. Create Audio CD that can be played on a home player. Burn Video DVD from the prepared folder. Create Video DVD which will be compatible with standard DVD players. Create ISO image from disc. Make exact copies of a disc on your hard drive. Burn on multiple devices at once. Burn disc from ISO image. Create ISO image from project. Extract files and folders from corrupted disc. Runs on Windows 7/Windows Vista/XP/2000. GEAR's recording engine is installed and running reliably on millions of PCs around the world. GEAR's updated drivers and device configuration files are always available for free download. GEAR's support staff is always available to help you through our Support Forums, or directly by e-mail. My Rating: Very Good - UsefulUtils Discs Studio is another lightweight disc burning software. It allows you to burn CD/DVD/HD/Blu-ray discs quickly without any complications. My Rating: Fair - Another lightweight disc burning software. Maybe too light for my taste. Once free, starting from the 1.6 version Explore&Burn went shareware so personally I don't like this kind of changes. Nothing so great to offer but for $15 you can't get anything better except free software. Burn any files to new CDs and DVDs or update discs burned earlier by adding new files and folders. Burn ISO images from your hard disk to physical media quickly and easily. Burn DVD-Video discs using the files in a prepared VIDEO_TS folder. Burn to any recordable CD or DVD - CD-R, CD-RW, DVD-R, DVD+R, DVD-RW and DVD+RW discs, including Dual Layer discs. Burn single-session and multi-session discs with ISO-9660, Joliet and UDF file systems. Multilingual User Interface English, Chinese(Simplified), Chinese(Traditional), Dutch, French, German, Russian, Spanish and Ukrainian languages. My Rating: Good - True Burner is BurnAware. BurnAware is TrueBurner. BurnAware was created by GloryLogic than sold to BurnAware Technologies and just like BurnAware Free True Burner is Ad supported (uses OpenCandy on install only) .OpenCandy is a service that lets application developers generate more money from their apps. My Rating: Excellent - We have a winner this year. ImgBurn is superior product in every possible way. This is by far the best piece of freeware I have ever used! Newbies: Don't get scared of the huge functions and options that ImgBurn has to offer, the friendliest way to use ImgBurn is in its Ez-Mode Picker view. It's interface can be as simple or complex as you want, offering either a few simple choices or a multitude of drive settings. Truly the best free CD/DVD/Blu-Ray Burning and Disc Imaging program around. This software has a lot to offer for both beginners and power users, so why to pay when you can get it for free! : Since 2006 when this topic was created, a lot of websites reproduced this topic in some form or another with a single purpose: more visitors, more money. I perfectly understand your needs but stealing is not nice. At least please give NEOWIN some credit when you try to copy other people's work. That's why starting from this year copying this article to your website is strictly NOT allowed. However, if you like this article, you can use the HTML code below to directly link to this article. Thanks everyone. Neat, you should add Deep Burner aswell. Cool thanks dude. Only; which is best? I really don't want to download everyone to try them all out. Can we have a poll or something? i've tried Sateira and Ashampoo, and I liked both, but Ashampoo is more "professional" and a clean interface. 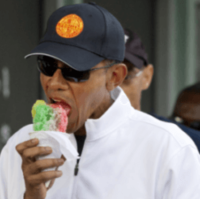 Somebody shoot this biggz character, please! Good thread otherwise though....a poll would be good. The CDBurnerXP Pro guys have a way to install without needing .net now, so if you're a .net hater, you can use it anyway :p.
I like Easy Media Creator, but if its bloat your trying to get a way from and a cheaper price then you may not like it. DeepBurner Free/Portable Edition and Padus DiscJuggler are missing. 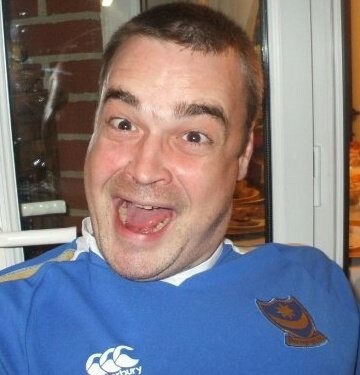 Personally I just use the older version of Nero, works as well as ever. Nice Dude, I was getting sick with Nero because it was messing up my Video CDs so i switched to Ashampoo and its going great at the moment! but has one major advantage - UDF , u can read/write CD or DVD just like on hard disc , so you take a 2 layered DVD, and get additional 7 G of disc space!! you do know that nero is still doing new 6.6 builds that arent 100mb. you may also want to include imgburn, it only does 1 thing but does it well. Only 321 kb. It's originally in Russian but fans translated it. It's so bloatfree, it trumps all other browsers. Very Nice Find! :) Here is a screenshot of it. Write your data to CD and DVD quickly and easily using FREE AVS Disc Creator. Simple and intuitive interface, fast performance a variety of features and supported media types make AVS Disc Creator a most convenient software to create data CD and DVD. For DVD support you can try this rename the cdrecord.exe to prodvd.exe then copy that and the cygwin1.dll to your external folder. Quit bao and restart it now you should be able to burn dvd-r only with no restrictions. Anyone got any other options or opinions? I know cirilic, so I have no problem using russian version, but the buttons are at the same places, so just compare with english version and viola, you will easily use russian version.